What is the Madden NFL 19 game? Madden NFL 19 is an American football sports video game based on the National Football League (NFL), developed and published by EA Sports. The MUT 19 is an important family member of Madden NFL series, the game was released for Microsoft Windows, PlayStation 4, and Xbox One. There were also changes to the Ultimate Team mode, introducing 3v3 online matchups as well as a Solo Battles game mode, a leaderboard oriented reward system that measures players' performances in daily single-player challenges. As one of the best-selling sports game of EA Sports, Madden 19 is also the only first class American football video game in market, there are no comparable adversaries for Madden 19. Why choice buying Madden NFL 19 Coins from Joymmo.com online store? 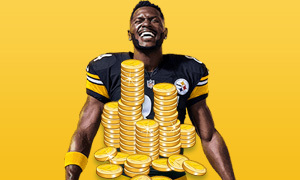 Come and buy Madden Coins at Joymmo.com. We trade MUT 19 Coins in the game of Madden 19. We are the professional and trustworthy site for selling Madden Coins with reasonable price, instant delivery, and best service for you.